Colin Lanceley was born in Dunedin, New Zealand and moved with his family to Sydney the following year. In 1954, while apprenticed to a printing firm as a colour photo-engraver, he attended evening classes under Peter Laverty at North Sydney Technical College, who encouraged him to begin full-time studies at the National Art School from 1956-60, where he was taught by John Olsen. In 1961 he formed the Annandale Imitation Realists with Mike Brown and Ross Crothall. In 1965 after winning the Helena Rubinstein Scholarship, he left for Europe for what was to become an extended stay of fifteen years. He settled in London in 1966, joining Marlborough Fine Art. Until 1981 he lived and worked in London, travelling in Europe and teaching in England. Since then he has lived and worked in Sydney. The title of the series 'The wasteland' is taken from T S Eliot's poem. Lanceley acknowledges his debt to Eliot, whose conjunction of images and ideas in poetry is reflected in Lanceley's interest in collage. The series consists of five prints plus title page. 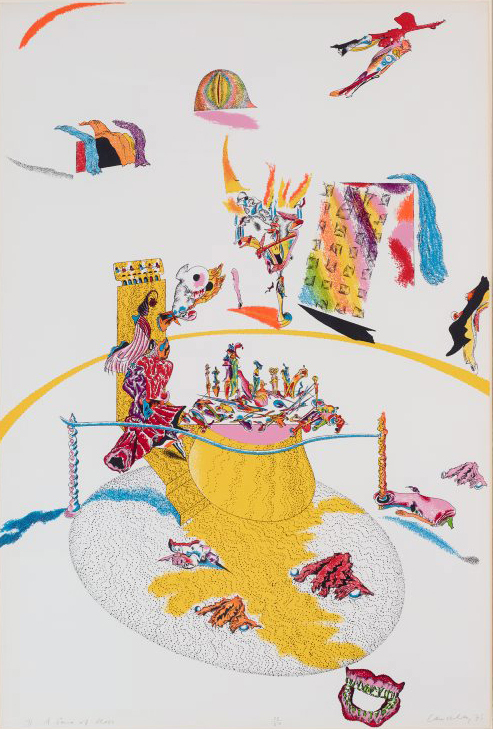 The Kelpra Studio first printed Lanceley's 'Miraculous mandarin' suite in 1966 (also in the Gallery's collection), the suite 'Some adventures of Don Quixote' 1972 and a number of individual screenprints, such as 'Bluebeard's castle' 1968 and 'Some are more equal than others' 1969. Signed and dated l.r., pencil "Lanceley 75".